After a short drive from the UNICEF office in Port Vila, through streets lined with homes and shops in various stages of post-cyclone reconstruction, we arrive at Fresh Wota Field; a big empty grassland with two goal posts. Small houses of different shapes and colours surround the young people engaged in an intense game of football despite the equally intense heat. We park under a tree to escape the heat and wait … and wait … for our scheduled rendezvous. We talk to the football players, make some phone calls and, just when we are about to leave, there they are; fifteen children carrying balls, water, a bright blue UNICEF bag and a big metal box. I jump out of the car and introduce myself. They all say hi back, but quickly return to their conversations. I can see that one slightly older girl, 21 year old Vinneth, is taking the lead, writing down names and ages. I watch and wait for Vinneth to finish organising the group into teams, which she tells me later “is always hard work!” The group has magically multiplied to 24 children now, their excitement bubbling over as they try to debate whether to play football or volleyball. After a lot of talking, they agree to play football now, and volleyball later, once the court on the other side of the field is free. The big metal box is then opened, revealing why it often seems like a ‘magic suitcase’ to the children who use it. The magic happens when you look inside and find so many different things; balls, frisbees, football nets, skipping ropes, a whistle, measuring tape, sports vests, t-shirts, caps, books, pens and crayons. All of that, in one metal suitcase! The metal box turning into a ‘magic suitcase’. 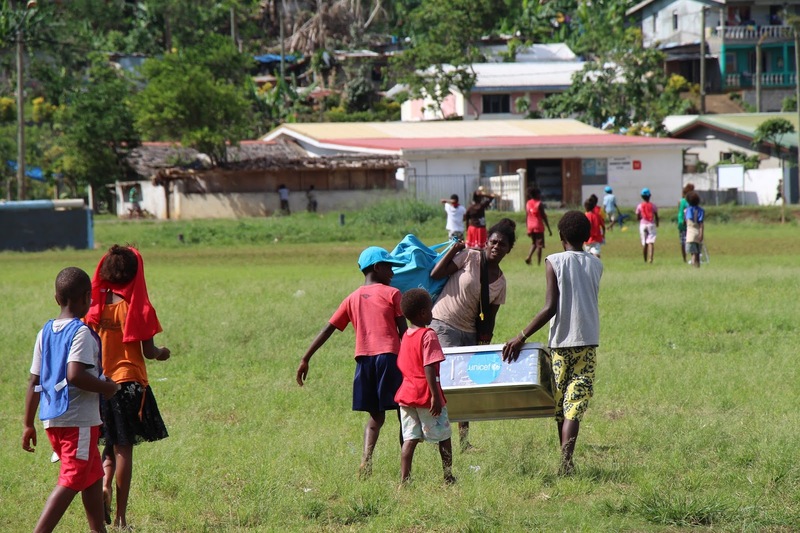 Category 5 Tropical Cyclone Pam hit Vanuatu nine weeks ago now, but the country is still recovering. 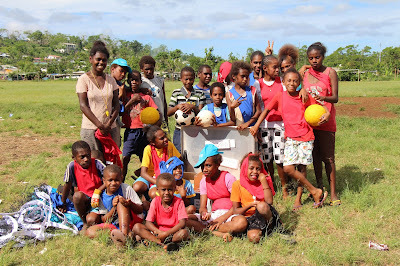 Footballs, drawings and games might not appear as useful in an emergency response as clearing roads and rebuilding houses but these items are actually incredibly important for the children who have experienced a stressful disaster. 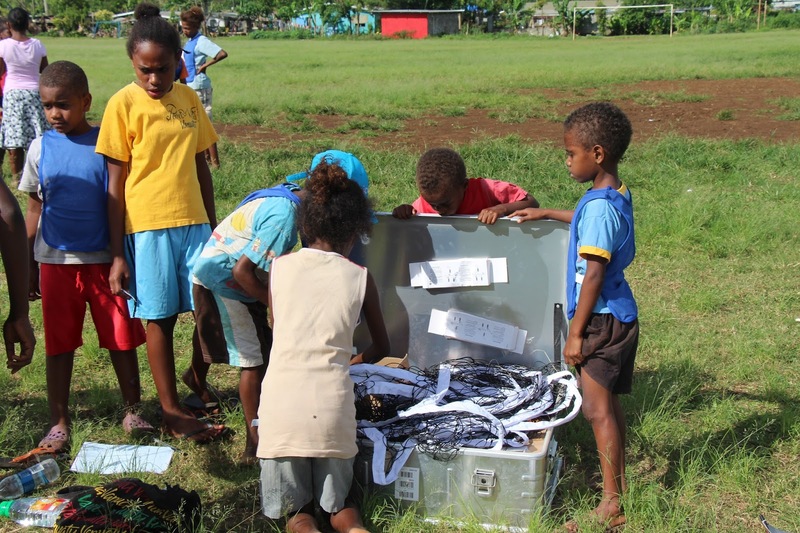 UNICEF’s ‘magic suitcases’ (officially known as Recreation Kits) are packed with all types of recreation equipment, providing young people, who have survived the stress of a disaster and may have lost everything they own, with some respite, fun, hope and a feeling of normality. The whistle is blown and the kids start playing football. With everyone distracted, I can now talk to Vinneth. With a bright smile and a little jewel on to her front tooth she tells me her English isn’t very good, but she gives it a go anyway. 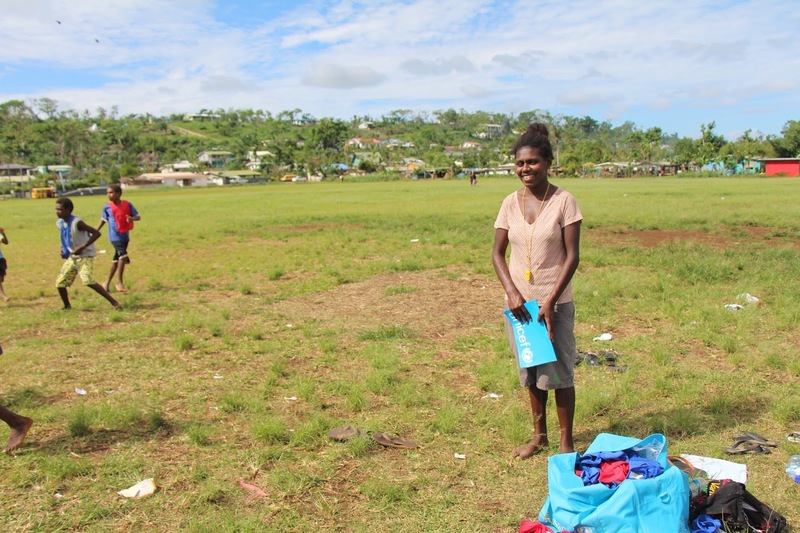 Vinneth and her mother were trained last month to be facilitators by UNICEF, Save the Children Australia and UNFPA, as part of UNICEF’s psychosocial support programme. 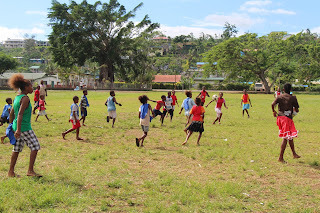 A facilitator has the big task of coordinating children, from early childhood to adolescent years, to play in a safe environment so they put the stress of Cyclone Pam aside and begin moving forward. and UNFPA, as part of UNICEF’s psychosocial support programme. Vinneth explains that playing helps children take their mind off the cyclone. It also helps them to stay away from harmful coping mechanisms, such as cigarettes, alcohol and violence. When I ask if she has seen a change in the children’s behaviour in the past month, she answers positively. She shares that some children were reluctant to play at first, but a few weeks later became confident playing, and participated in all the activities with the other kids. She strongly believes that play is helping children to recover. Vinneth is a natural. She was doing this type of work before the cyclone through a faith-based programme where she coordinated children to play, so she is used to dealing with twenty-four children running around with lots of energy. She explains that with UNICEF’s recreation kit she has been able to improve what she was doing. 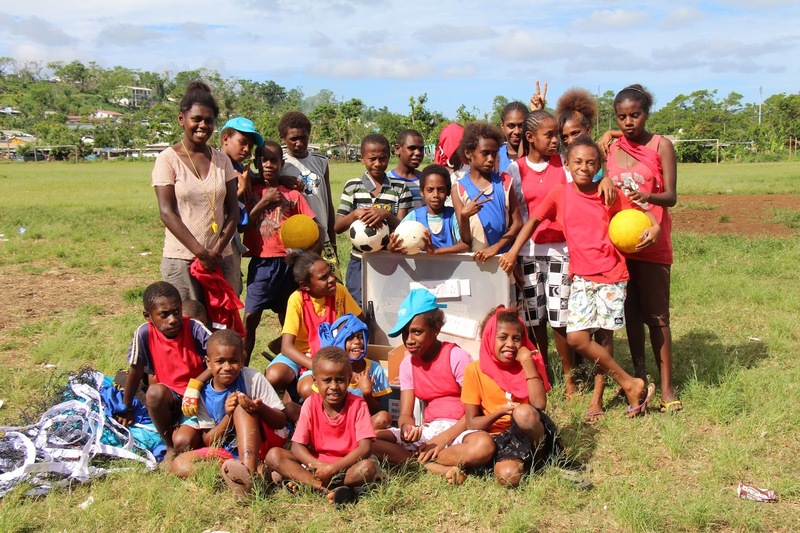 The many different types of sports equipment have helped her develop the existing programme she was running prior to Cyclone Pam. Besides addressing through sports psychosocial distress experienced by children, Vinneth now also spreads simple messages such respect for their peer boys & girls, informing parents where they will be going and when they will return. The ball comes close to us and almost hits me. We laugh and I can see she is happy to see the kids play and enjoy themselves. It is time for me to let her do her job, which she does with passion. I chat with a few other kids who tell me they love playing sports. They still don’t really agree on which sport they prefer, but it doesn’t seem to matter too much to them, as long as they get to play.